Mutual Fund taxation or tax on Mutual Funds is something that has always kept people curious. Mutual Fund capital gains are taxed considering certain rules and regulations. Generally, to save tax people tend to invest in Mutual Funds. But, not many people are aware that Mutual Fund returns are taxed as well under the head Income Tax Capital Gains. So before Investing in Mutual Funds, it is important to understand the mutual fund taxation or taxation of Mutual Funds. Under this option, the returns from Mutual Funds are automatically re-invested and you get these gains only when you sell the Mutual Fund units. Contrarily, with the dividend option, you can earn the Mutual Fund returns at regular intervals in the form of dividends. It works as a regular income for Mutual Fund unit holders. Now, these different options are taxed according to the type of Mutual Funds. Also, Mutual Fund Taxation depends on the types of asset class – equity or debt, and each is taxed differently. Equity Mutual Funds are those funds that invest more than 65% in equity related instruments and the remaining in debt securities. Taxation on these funds varies for both dividend and growth options. Short Term Capital Gains - When Equity Mutual Funds with growth option are sold or redeemed within a one-year period, one is liable to pay a short term Capital Gain tax of 15% on returns. Long Term Capital Gains - When you sell or redeem your equity funds after a year of investment, you are taxed at 10% (with no indexation) under long term capital gain tax. As per the Budget 2018 speech, a new Long Term Capital Gains (LTCG) tax on equity oriented mutual funds & stocks will be applicable from 1st April. Long-term capital gains exceeding INR 1 lakh arising from redemption of Mutual Fund units or equities on or after 1st April 2018, will be taxed at 10 percent (plus cess) or at 10.4 percent. Long-term capital gains till INR 1 lakh will be exempt. For example, if you earn INR 3 lakhs in combined long-term capital gains from stocks or Mutual Fund investments in a financial year. The taxable LTCGs will be INR 2 lakh (INR 3 lakh - 1 lakh) and tax liability will be INR 20,000 (10 per cent of INR 2 lakh). Fair market value of the shares as on January 31, 2018 to be the cost of acquisition as per the grandfathering provision. How are the Capital Gains Calculated? b) the lower of fair market value on 31st Jan and Sale price/Redemption Value. i) All such long term gains to be added up and a deduction of INR 1 lac to be allowed. ii) On the balance amount (if its positive) one needs to pay tax @10% ++. The other kind of Mutual Fund is debt mutual fund, which invests mostly (less than 65%) in debt instruments. Some of them include ultra-short term Mutual Funds, Liquid Funds, funds of funds etc. As for the equity funds, mutual fund taxation for debt Mutual Funds varies as well. Short Term Capital Gains - If the holding period of debt investment is less than 3 years, a short term capital gain tax of 30 % is liable. Long Term Capital Gains - When the debt investments are held for more than 3 years, the returns are taxed at 20% with indexation benefit or 10% depending on the investment. Unlike equity Mutual Funds, a DDT (Dividend Distribution Tax) is deducted from the Mutual Fund NAV (Net Asset Value) of your debt investment. Taking a simple example with a purchase value of investment being INR 1 lakh in 2017 and selling it after 4 years for INR 1.5 lakhs. Index numbers are given below (illustrative). 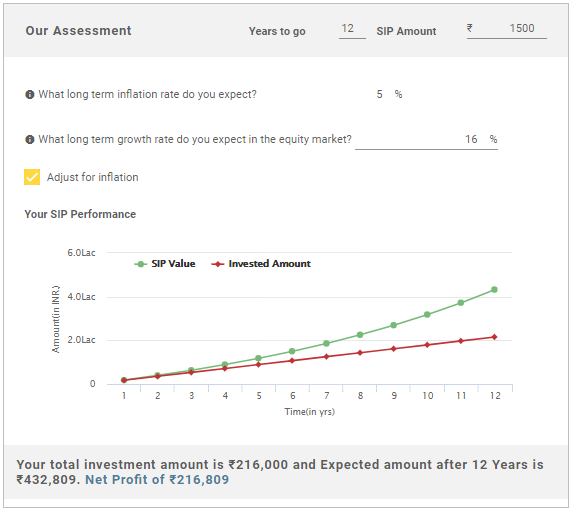 The most critical step involved here is a calculation of the indexed cost of the investment. Indexed cost = Cost value of the investment to be taken in calculations. Now that you know the taxes liable on different kinds of Mutual Funds, you should try to get the best out of it by choosing the right Mutual Funds. The above is a guidance basis the tax structure for FY 2017-18, choosing an investment one should look at the relevant tax structures, for e.g. in debt schemes going for dividend option in the short run may invite lower tax. However, before making any decision one should get an opinion from an independent tax adviser and take action. Earn better returns, save more! ☆☆☆☆☆ Rated 4.5, based on 44 reviews.